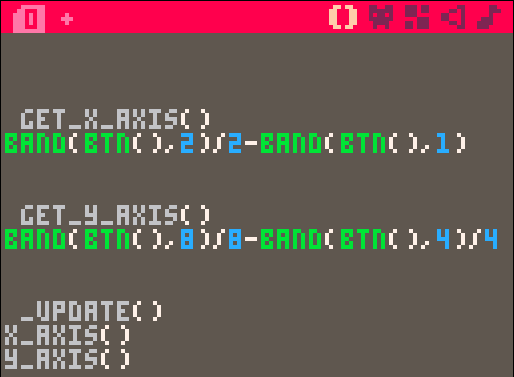 But a more elegant solution is to use the bitwise addition function band(). Calling btn() with no arguments results in a bitfield of outputs. In other words, pressing button 1 (right) gives 000010.
so 1-0 returns 1, i.e. move to the right (positive). By checking the bits and subtracting the right from left (or down from up) we end up with a value of -1 or 1 for the movement. I’ve wrapped the bitwise calculations here into two functions for neatness (get_x_axis and get_y_axis), but this is slightly profligate with tokens and by directly referencing the band() function you can reduce your token count by two from the standard conditional method shown above. Feel free to use, and if you spot any further optimizations, let me know!